EZYFLOW GYPSUM is a liquid suspension of technical grade Calcium and Sulphur applied to improve your soil structure by reducing sodium build-up and increasing Calcium levels in the soil. With an approximate particle size of 2 microns it can be used in fertigation down the drip line and also as a foliar. Gypsum is one of those rare materials that perform in all three categories of soil treatment: an amendment, conditioner, and fertilizer. Gypsum can help create favorable soil by lowering EC, as a high EC value of soil is undesired for the crop growth. High EC of soil can be due to fertilizer application as well as weathering of soil minerals. Gypsum, being readily soluble, results in proper buffered solute concentration (EC) in soil to maintain soil in a flocculated state. Calcium is essential to the biochemical mechanisms by which most plants nutrients are absorbed by roots. Without adequate Calcium, uptake mechanisms would fail. In soils with unfavorable Calcium Magnesium ratios, such as serpentine soils, Gypsum can create a more favorable ratio. Gypsum is very useful for improving the textural and drainage properties of heavy (clay) soils. Gypsum is also an excellent calcium and sulphur fertiliser. Its special benefits are that horticultural Gypsum is fast acting and pH neutral (contrasting with other Calcium fertilisers that are slower and either raise or lower soil pH). Gypsum provides Calcium, which flocculate clays in acid and alkaline soil. A flocculated clay forms friable soil with improved soil structure and tilth. It also allows for deeper, healthier root development and water penetration. Gypsum when applied to sodic soil reduces the levels of exchangeable sodium resulting in increased water retention. Gypsum is another source of Calcium responsible for the binding of soil organic matter to clay and gives stability to soil aggregates. Gypsum can help keep clay particles from adhering to roots, bulbs and tubers of crops like potato, carrots, garlic and beets. Liquid Gypsum is much easier to handle and apply via boom spray, drip systems, overhead irrigation and aerial applications compared to the spreading of bulk Gypsum. Natural Gypsum has unique chemistry properties. Gypsum also known as Calcium Sulphate will react very quickly with Sodium to form Sodium Sulphate, and leach from the soil profile quickly. Gypsum is particularly fast acting due to its approximate 2 micron particle size. Great source of Calcium and Sulphur for plant nutrition. Gypsum has an approximate particle size of only 2 microns and can be used in fertigation down the drip line and also as a foliar. Gypsum is a natural Gypsum and is ideal to reduce Sodium in high pH soils. Specific gravity approximately 1.35 colour is cream suspension. To ensure even mixing, half fill the spray tak with clean water and add the required amount of product. Agitate thoroughly then add the remainder of the water. Agitate thoroutghly while carrying out spray operations. Reseal part-used containers immediately after use, the same applies for fertigation. GYPTECH® is suitable for application to all soils where compaction, high sodium, salt build-up, low Calcium and high pH remain a problem. Application rates may vary widely depending on your crop, soil type and other factors. As a result of over 12 years of Gypsum applications. Avoid application under extreme weather conditions, temperatures over 28 C, high humidity, frost or rain. 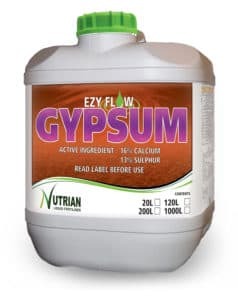 EZYFLOW GYPSUM is suitable for application to all soils where compaction, high sodium, salt build-up, low Calcium and high pH remain a problem. Application rates may vary widely depending on your crop, soil type and other factors. Keep out of reach of children. When handling or using this product avoid skin and eye contact, ingestion or inhalation of spray mist. Always wear protective gloves, goggles, hat and protective clothing. Should the product be ingested or symptoms or signs develop after contact with the product, contact your doctor.